The Spiral Cut Pattern (or Spiral Non-steep Cut Pattern) is available in NX CAM 12.0.2 when you create operations using the Area Drilling Drive Method. 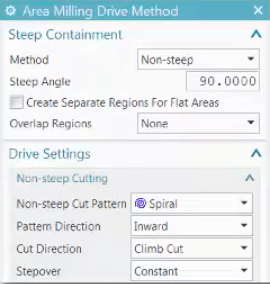 You can see that this new option is now available in the Area Drilling Drive Method command. It’s located in the Non-steep Cut Pattern option, under Drive settings, of that command. You can see the window below. Spiral Cut Pattern: What Does This Milling Operation Do? This type of milling can produce a better finish by cutting continuously. This results in minimal step-overs. It can also reduce machining time by limiting engage-retract motions between passes. Siemens PLM Software has a sample video of this new option below. You can see the continuous cut motion. Looking for more NX CAM content? Check out our information on what’s new in NX CAM 12.0.2. If you’re looking for help on the NX CAM side, PROLIM offers NX CAM Training and CAM services. You can also take a look at our library of YouTube content.